Looking for the perfect no bake dessert? These easy Mars Bar Cheesecake Balls are for you!! Both regular and Thermomix instructions included. 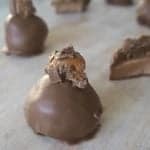 If you love my Mars Bar Cheesecake and/or Mars Bar Slice recipe, then these cute bite sized Mars Bar Cheesecake Balls may just become your new favourite dessert! They are based on my Snickers Cheesecake Balls recipe and I’ve simply replaced the Snickers bars with Mars Bars and then added an extra piece of Mars Bar on top, after all, you can never have too much Mars Bars in one dessert right?! Along with tasting just amazing, these no bake Mars Bar Cheesecake Balls contain just THREE ingredients (as does this Mars Bar Fudge 😉 )and they can also be made a day or two in advance – perfect if you are entertaining or need to take a plate to a special occasion. If you are looking for more great no bake dessert recipes, this recipe collection is for you – or you might also like this easy no bake Maltesers and Mars Bar Cheesecake Recipe!! These three ingredient no bake Mars Bar Cheesecake Balls make a great easy dessert for your next party or event. Both regular and Thermomix instructions both included. Line a baking tray (or plate) with baking paper and set aside until needed. Using a food processor, blend THREE of the Mars Bars until they become a lumpy paste. Add the softened cream cheese and blend until combined. Roll the mixture into balls (I made mine dessert spoon sized) and place on tray. Continue until all the mixture has been used. Place tray/plate into the freezer for a minimum of half an hour, as you want the cheesecake balls to be very firm. In the meantime, break the milk chocolate into pieces and place in a microwave safe bowl to melt (you can also melt the chocolate in a bowl sitting above a saucepan on boiling water on the stove). I cook the chocolate for 30 second spurts until it’s almost melted and then stir it until it had completely melted. Remove the balls from the freezer. Poke a skewer into the bottom of the balls and dip them in the melted chocolate. Place on a wire rack to set. Repeat until all the balls are coated. Decorate the balls while the chocolate is still soft a small piece of Mars Bar. Repeat until all of the mixture has been used. Place the Mars Bar Cheesecake Balls back into the freezer for half an hour, or until the milk chocolate has set before serving or transferring into an airtight container in the fridge. These Mars Bar Cheesecake Balls can be made up to two days in advance. Once made, store in the fridge in an airtight container. Place THREE of the Mars Bars into your Thermomix bowl and blitz for 5 seconds on speed 7. Add the softened cream cheese to the Thermomix bowl with the crushed Mars Bars and blitz for 10 seconds on speed 5. Scrape down the sides of your Thermomix bowl and mix for a further 10 seconds on speed 5 or until combined – it may take a little longer if your cream cheese isn’t completely soft. You can find more great no bake desserts in our No Bake Christmas Recipes eBook.